A sea of activity around the Waihinga Centre continues as Opening Day draws closer. Outside, workmen are feverishly filling in the block work around the terraces and exterior fencing has been erected. Inside the Town Hall the wooden floors have been sanded and painting is underway. The old canopies to fit over the main front doors are being newly painted and reinstated. In the new building carpet and vinyl have been laid, the joinery has been installed and is just waiting for the stone counter tops to arrive. Outside the cedar screens to cover the Rodeca panels will provide the finishing touch to the front façade. With numerous details to attend to such as; lighting compliance with dark sky requirements, sign off for code of compliance for public use, compliance for fire protection, security alarms, signage, café furniture, air conditioning and plumbing the contractors are scurrying to meet their deadlines. 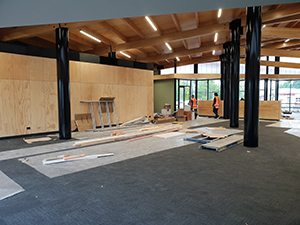 Moving Day is scheduled to begin around the 15th November when The Library, I Site, Plunket and Toy Library will begin the move from their present surroundings to the new location. Stage One is finally coming to a close. Many generous individuals, groups and funding bodies have helped raise the money to strengthen and upgrade the old Town Hall, build the Waihinga Centre, and create a new playground and park. Support has also come in other important ways and we want to acknowledge some of these here. Thanks to Toast Martinborough, who are paying for the necessary furnishings, we will now have a Wine and Food Library in the Waihinga Centre. It will be dedicated to Richard Riddiford who was the driving force behind the founding of Toast in 1992 (just one of his many significant contributions to Martinborough). “Without Richard, Toast Martinborough wouldn’t exist“, says Roger Parkinson, the current Chair. As the library collection develops it will become an important resource both locally and beyond. Local glass artists Jim Dennison and Leanne Williams of Crystal Chain Gang have generously gifted one of their Feather Drop chandeliers for the foyer of the Town Hall. Their work has been internationally recognised so we are thrilled to have an example of it in our new space. The picture shows how stunning this design can be. We are starting with a more modest version but it can be added to in the future as funding allows. The entrance of the Town Hall will feature the work of another local artist, Ben Masters of Paperhands He and Helen are gifting wallpaper designed and handmade by Ben at his workshop on Jellicoe Street. The heritage design will enhance the character of the building. We also have two benefactors who wish to remain anonymous but who have made significant gifts to help complete the furnishing of the Town Hall. One gift is for the six main LED ceiling lights that will be crucial in creating an attractive ambience. The other donor is providing all the curtaining in the main hall and supper room. Those who have ever had curtains made will appreciate the value of this gift! Local company, Perception Planning, undertook the resource consent work at a significant discount and Gawith Burridge helped with the legal paperwork in setting up the trust so that we could manage the donated funds. Powerco has also been a generous corporate citizen. As a consequence the village will now have an electric barbecue for public use in the remodelled park next to the centre, as well as some outdoor furniture to go with it. Roll on summer! By the beginning of December the thousands, of different elements involved in this project will finally come together. The opening in December will be the culmination of a huge effort by the many people who have worked on and worked for this project. It will be a proud day for the Martinborough. Stage 2 fundraising is in full swing, thank you to all of our supporters so far. A Bisley & L Wevers, N Bomann, J & A Brodie, L & F Cornelissen, H & B Cox, L Daly, C & M De Groot, Down to Earth Gardening Group, Eastern and Central Trust, Foley Family Wines – TK Farmers’ Market, 4WD Fundraiser, R & L Griffiths, M&S Guscott, B & B Hancox, M&D Hill, Kebbell Family, D Kershaw, H Kershaw, H Kirk, J & P Kirkup, D & J Maloney, Margrain / Thom Family, J Martin, L Martin, Martinborough Community Board, Martinborough Lionesses & Martinborough Community Board Bike Stand Project, Martinborough Lions, Mitre 10, Neighbourhood Coffee, Pain Estate, Palliser Estate, Kate Paterson and Matt Gloag, B Pearce, W Pearce, Powerco, Milly, George & Buster Richards, A Sears & D Woodham, South Wairarapa Rotary, S Stephen, M & N Thomas, Wairarapa Building Society, J Wilkie. We have many other smaller and anonymous donors too who we would also like to thank. A new complex of telescope domes and high-quality astronomy facilities is quietly rising on a Ruakokpatuna paddock east of Martinborough _ below some of the darkest skies in Martinborough’s proposed Dark Sky Reserve. The owner of this “Star Field,” local astronomer John Whitby, will soon have at least three observatory buildings on the site, including two with roll-off roofs for night sky observation. Whitby said the plan is to provide the public with access to the region’s world-class skies with facilities that allow all visitors to experience high-quality viewing, video astronomy and astrophotography. Astronomy guides will help provide public outreach and education. A series of high-end telescopes will be installed in the buildings, while a video imaging rig will broadcast live night-sky images world-wide. One 3-metre dome observatory will house high-quality astrophotography equipment. A separate control room will house the computing equipment for the two imaging observatories. The Wellington Astronomical Society is negotiating with Whitby to house a remote observatory on the site. 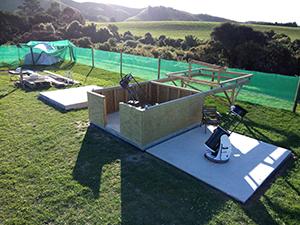 This 5-metre dome observatory will house a scientific grade 24-inch telescope, remotely controlled from Wellington for the Society’s use. “The same topography and dry climate that has made Martinborough famous for wines has also brought regular clear skies and steady seeing,” he told the “Martinborough Star. “Star Field’s unique surrounding topography produces exceptional seeing and transparency along with very clear night skies,” he added. Whitby, who spent five years looking for such a site, says he plans to hold regular “star party events” and astrophotography workshops at the facility, along with world-wide broadcasting of deep sky images, live and in colour. The main purpose of the Ruakokpatuna complex is “to share a dark sky site with amateur astronomers and budding enthusiasts of astronomy,” he said. Tourism would generate revenue that will assist on-going development at the site, where a cafeteria, astrophotograhy gallery and ablution block will also be built. Whitby said the Ruakokpatuna site has world-class dark skies and is located away from the light pollution of Martinborough town _ but just 10 minutes away. Initial concrete work for three observatories has already been laid, and the first roll-off roof observatory is partly built. It will house one 18-inch and two 12-inch GOTO Dobsonian telescopes. “John is making a huge commitment to Martinborough with the amount of investment, time and energy he is personally putting into developing this world class facility within the proposed Dark Sky Reserve. The community, schools and tourists will all have access to facilities most places in the world could only dream of,” he said. “It is vital we put in place some sensible rules on responsible lighting to protect the clear night sky views we all enjoy. We can see from satellite images that the spread of light pollution is accelerating, even in Martinborough,” Mauger said. A Responsible Lighting guide is available in the local library and we encourage everyone to grab a copy of it, he said. “We’re working with the council to establish a responsible lighting policy, which is required for our application to become an internationally recognised Dark Sky Reserve.” he added. Thank you for being awesome Greater Wellington and Wairarapa! November 21, 2018 November 2018 Comments Off on Thank you for being awesome Greater Wellington and Wairarapa! You showed us the most incredible Onesie Day this year, and we are so lucky to be surrounded by such a generous community. To everyone who dressed up, helped us collect, or put money in the bucket, thank you so much. Your willingness to get into the spirit and raise money for us is hugely appreciated. And a drum roll for the grand total raised…$160,000! Wow!